Plasma TVs – Why they are still, and always will be, superior to LCD and LED TVs – Belco Inc. I have followed electronics as a hobby since I was about 10 years old. Back then I was more into portable stereos (boom boxes) and home stereo systems. I loved looking at the Crutchfield magazines and reading about the cutting edge stereo technology available. Back in the mid 1980’s, I got a Yamaha DSP1 digital soundfield processor, which was one of the first surround sound systems for home theater use. It wasn’t cheap, and it was somewhat difficult to set up. That is when I got my first lesson in why it’s important not to buy the newest technology immediately when it comes out. Later on in the 1990’s I started hearing about flat screen plasma televisions, but they were over $15,000.00 back then, and you rarely saw them anywhere. In addition, DVD players and digital high definition television broadcasts weren’t readily available at the time. There was, however, already talk of the possible upcoming advances in video display technology. As this technology advanced I became more and more interested in big screen flat panel television sets. It was in 2005 when I bought my first Plasma TV. I bought a Panasonic 50” plasma TV, and I am still amazed at the picture quality. We chose a Plasma TV over an LCD TV because, to me, standing in the store looking at dozens of TV screens side by side, consistently, the plasma displays looked more natural, seamless, detailed, and brilliant. Also, for some reason, LCD TVs seemed to fatigue my eyes trying to focus on the picture. Over the years I’ve learned why it is that a Plasma TV is so much better looking to me. The key difference is in how the viewing screen is made–and it’s a big difference. Plasma TVs rely on hundreds of thousands of tiny individual plasma light bulbs to make up the picture similar to the way pixels on an old CRT screen made a picture. Each individual light bulb is lit to a precise brightness level and color according to the electronic signal sent to it. The number of these light bulbs on an individual screen is equivalent to the native screen resolution. LCD TVs have hundreds of thousands of tiny liquid crystal cells that open and close to a precise level when power is applied to them. These liquid crystal cells let light through the screen from a constant fluorescent backlight, similar to how window blinds allow sunlight to pass through as they are opened and closed. The number of these cells on an individual screen is equivalent to the native screen resolution. An LED TV is just an LCD TV that uses LED backlights instead of a fluorescent backlight, so they share most of the same basic characteristics as LCD TVs. What this means is that with a Plasma TV you are looking directly at the source of light, and with LCD and LED TVs you are looking through “a set of blinds” to the light source, which causes a lot of problems. One problem the “blind effect” causes is a decreased viewing angle. With an LCD or LED TV you will see the best picture if you are sitting directly in front of the TV. The picture will degrade and darken with every degree of angle you move farther from direct center of the TV –until you can’t see the picture at all on the screen. With a Plasma TV, since you are looking directly at the light source there is no “cut off angle”. That means you can see the screen as vividly looking at it from the side or the top as you can directly in front of it. This allows everyone in the room to enjoy the same beautiful, bright picture, no matter where they are located or whether they are standing, sitting, or lying down. Another problem the “blind effect” causes is a reduced contrast ratio in LCD and LED TVs compared with Plasma TVs. Contrast ratio is the comparison of the blackest black to the whitest white and allows you to see details in a dark picture. A visible example of a high contrast ratio vs. a low contrast ratio is being able to see individual strands of hair on a dark-haired person on the screen vs. seeing a dark blob of hair with no visible strands on a low contrast ratio screen. It’s easier to achieve high contrast ratios on a plasma screen than on an LCD screen because it’s easier to turn an individual light bulb off on a plasma screen and make the pixel completely dark than it is to close the blinds on an LCD cell and block all the light out to make it completely dark. Remember, the light source for an LCD TV is a fluorescent backlight that is always on. And, again, if you aren’t sitting directly in front of the LCD TV the contrast ratio will suffer greatly as the viewing angle increases, while there is no such problem with Plasma TVs. LCD TVs are getting better at this, but they are still just trying to match what Plasma TVs already do naturally, and using a lot of expensive technology to do it. The biggest problem the “blind effect” causes is called motion blur. And this is where there is really no comparison between the two technologies. Until about 4 years ago, Plasma TV manufacturers didn’t even advertise a specification on this issue, because for them, it doesn’t exist. There is no motion lag, drag, or blur in plasma TVs, nor is there side-to-side judder when panning because each individual pixel creates its own color, basically in an instant, as needed. In LCD and LED TVs, the LCD cells have to mechanically open and close to filter the light and create color, and regulate the brightness of an individual pixel. This means there is a time element involved to get “the blinds” turned to the correct angle. This causes the picture to blur when objects move quickly across the screen, or when a camera pans and the background moves across the screen quickly. The LCD cells can’t accurately keep up with this, while Plasma cells have no trouble. LCD and LED manufacturers advertise their specs on “Refresh Rate” to compare this problem between LCD TVs. The basic refresh rate used to be 60 hz (60 times per second) on older LCD TVs. Today the more common refresh rate on LCD and LED TVs is 120 hz, which has reduced this problem. You can pay extra and get an LCD TV with a 240 hz or even a 480 hz refresh rate. To demonstrate how this is not a problem for Plasma TVs, Plasma TV manufacturers started advertising a 600 hz refresh rate on basic Plasma TVs a few years ago, even though that number is actually not real because the problem is non-existent in Plasma TVs. The bottom line is, you can spend a lot of unnecessary money for a top of the line LCD or LED TV with all the latest technology that is just trying to match the picture quality that a basic Plasma TV has always been able to deliver. Today, a 50”, 720p, Panasonic Plasma TV similar to the one I paid over $3500.00 for about 6 years ago, will cost about $700.00. A name brand high contrast ratio, high refresh rate 50” LCD TV will cost over $1000.00, and a similar quality LED TV will cost you over $1200.00. Let your eyes be the judge, and don’t think that just because one TV costs more than another that it is automatically a better product. 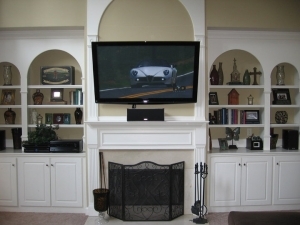 If you are looking for a company to help you with your home theater installation in Atlanta please give Belco a call. We can help you wall mount your flat panel TV, including wire management, and installing an electrical outlet behind the TV. In addition, we can run your speaker wire, interconnect your audio video equipment, provide surge protection, and even help suggest the components you will need for your set-up and to get the most out of your home theater experience. Please feel free to comment on whether you agree or disagree with this article, or if you have anything you would like to add. Also, you can post a question or call me if you would like more information on this subject. As a hobby, I enjoy discussing flat screen television technology and am interested in learning more about it myself. Great article and very well described. And right in time as I’ve been looking at getting into the 21st century and ditching my old 20″ CRT.